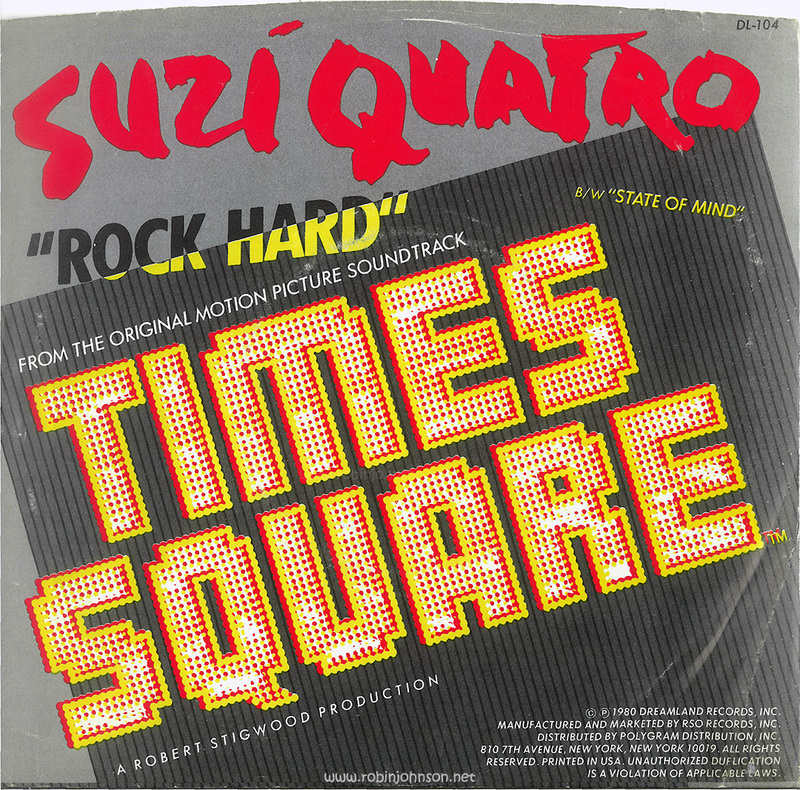 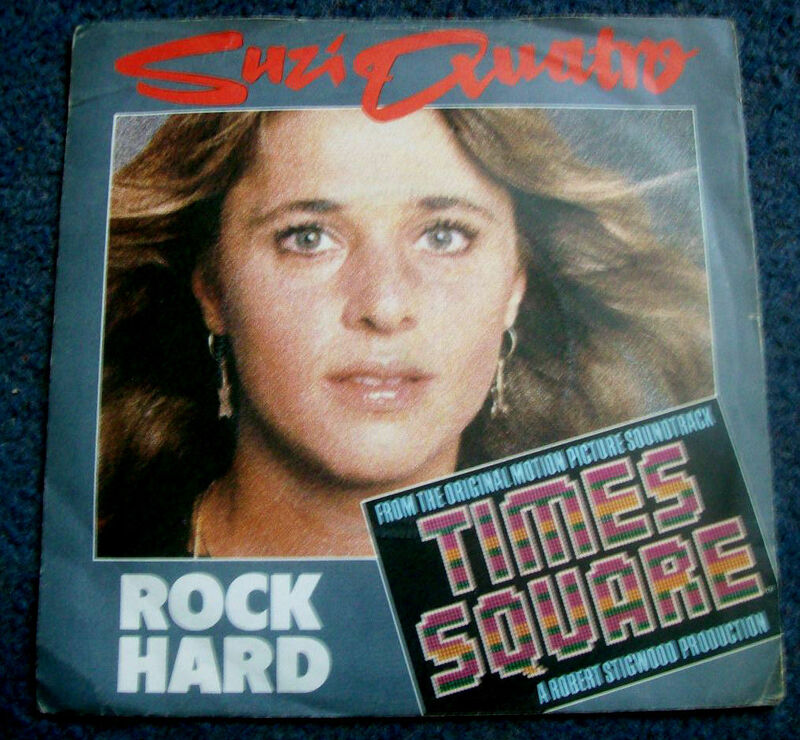 Posted on 17th September 2015 in "Times Square"
The singles from the soundtrack started coming out before the album, which came out before the film. 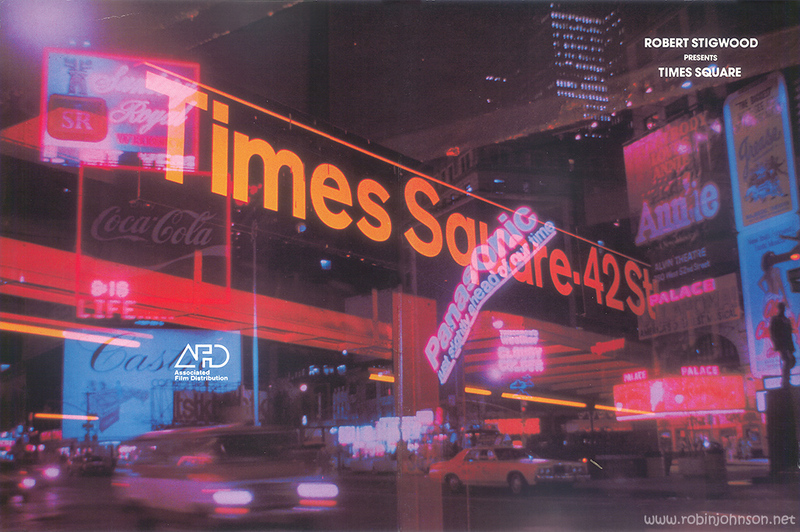 It was here that I realized collecting everything to do with Times Square would be hideously expensive, so since my focus was Robin Johnson, items connected to the movie but which didn’t have a picture of her or mention her name were beyond my purview. 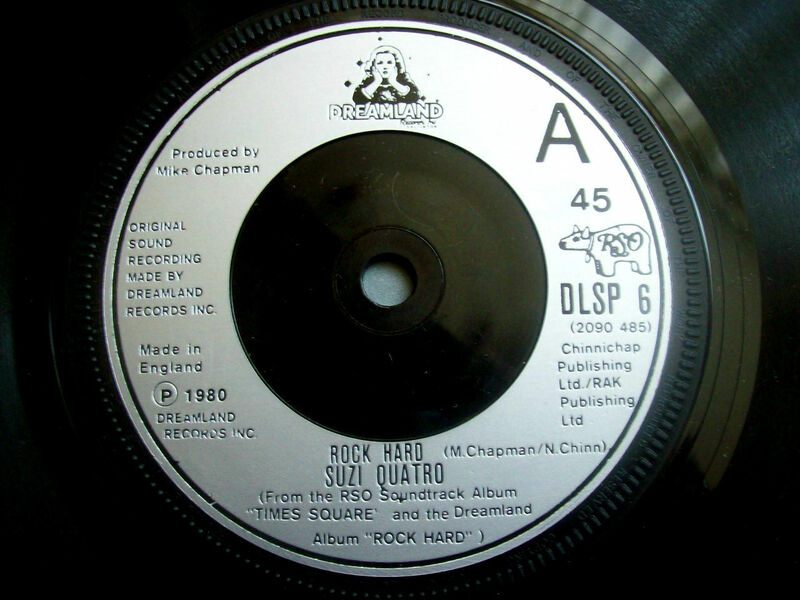 Therefore, I don’t have all the soundtrack tie-in singles, and some of these will be images from elsewhere on the Web. 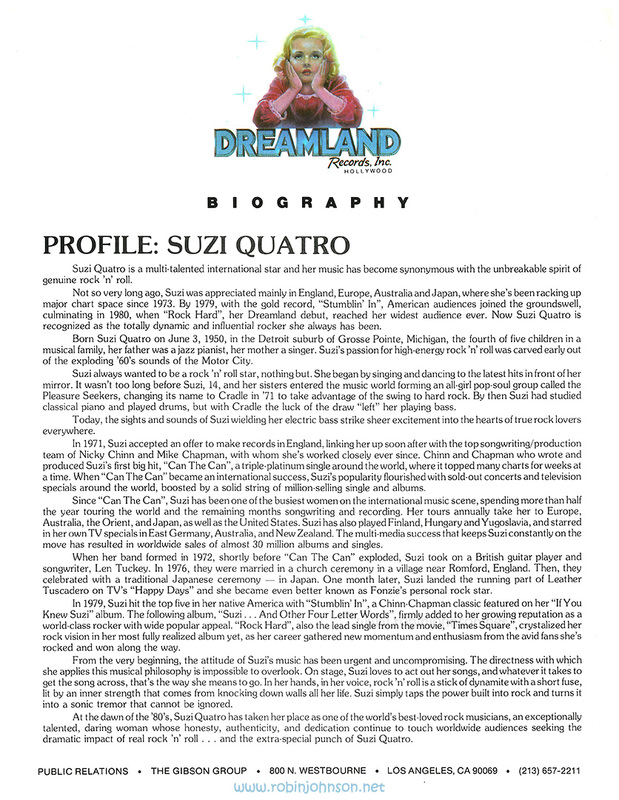 Dreamland Records’ biography of Suzi Quatro. 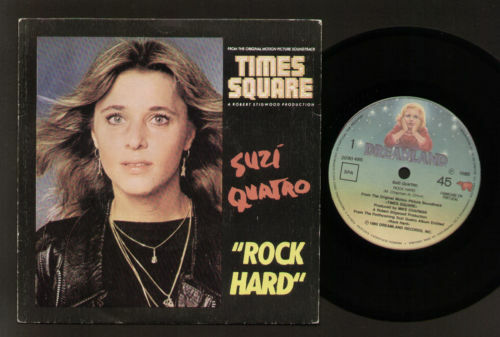 This may not have been the one, but it’s the one I couldn’t help myself from getting, coming as it did with the photo and bio. 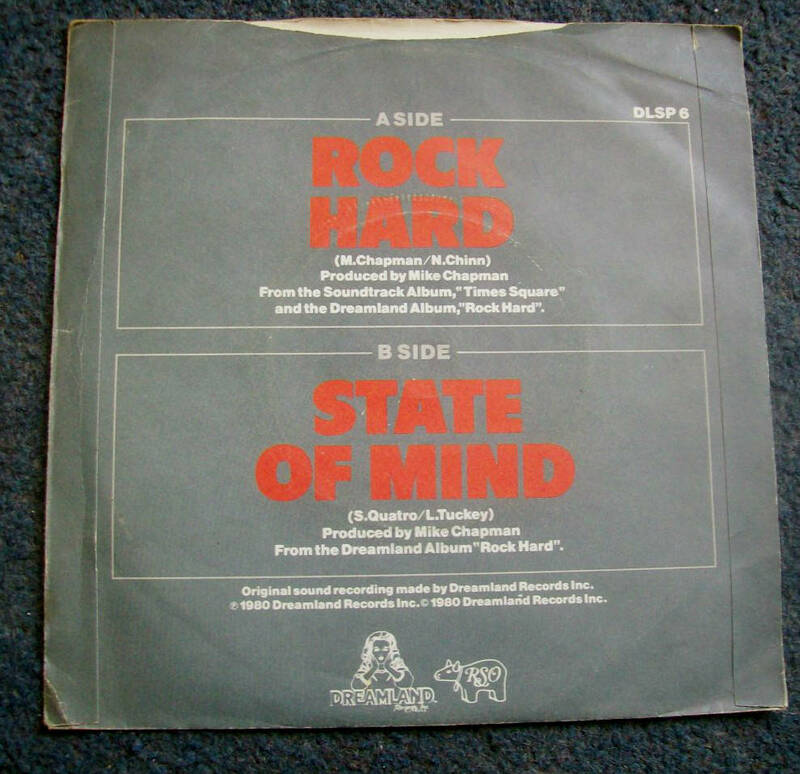 The front and back of the sleeve are nearly identical, and although it clearly states that the b-side is “State of Mind,” the b-side is really a monaural version of “Rock Hard.” The non-promotional editions of this single were released world-wide and all of them were slightly different, but they nearly all featured a color version of the black-and-white photo, and actually had “State of Mind” on the flip side. 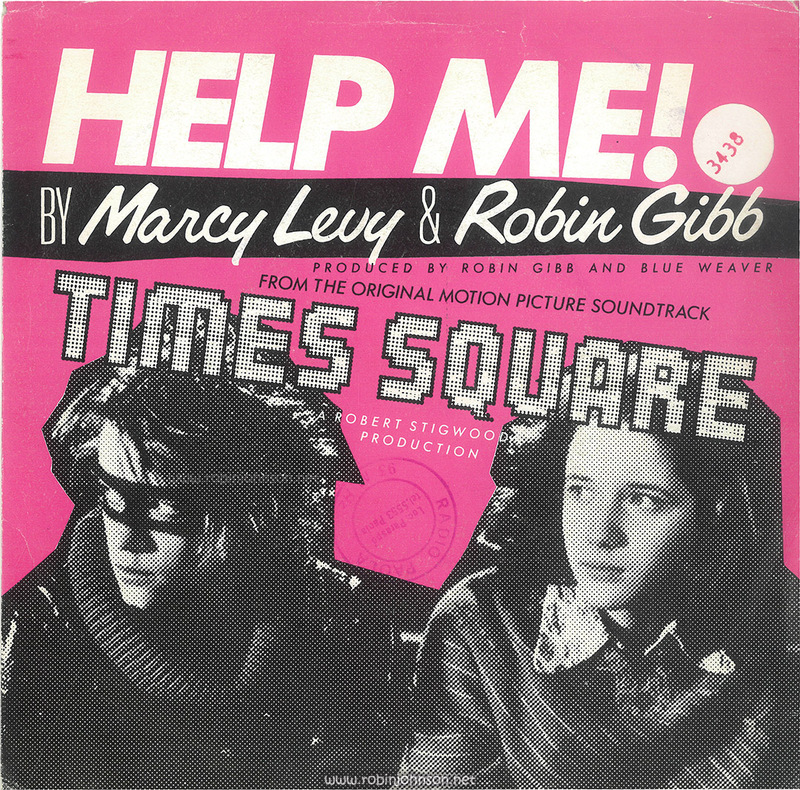 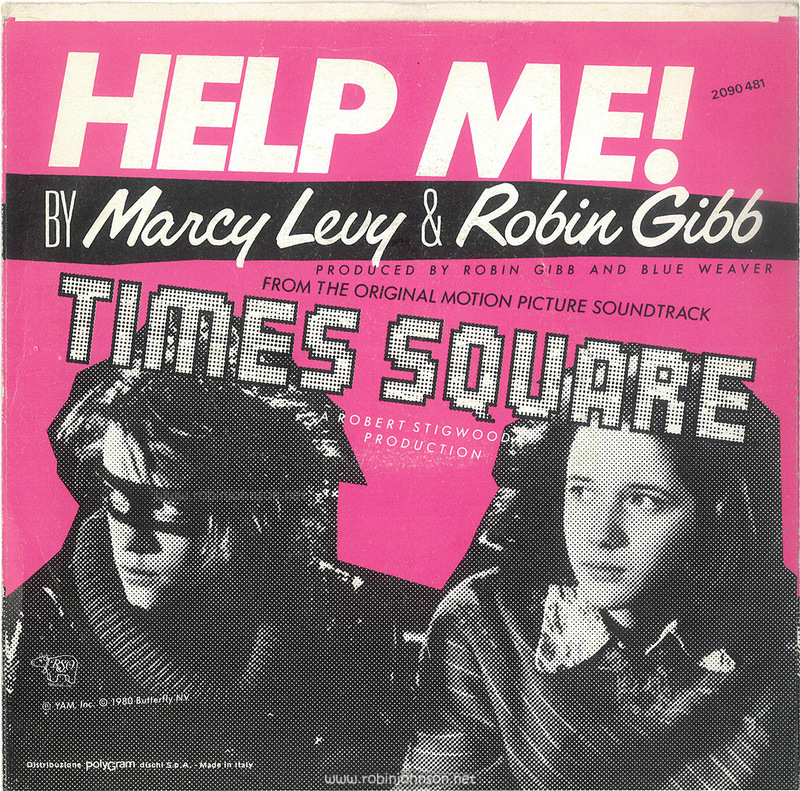 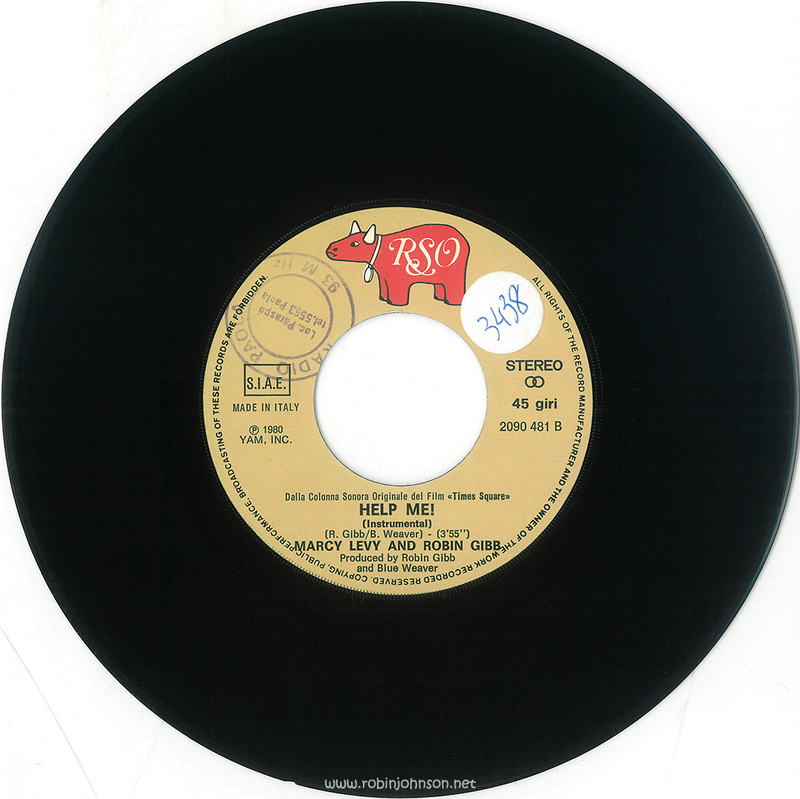 The “Help Me!” single was one of the only two to feature an image of Robin and Trini on the sleeve. 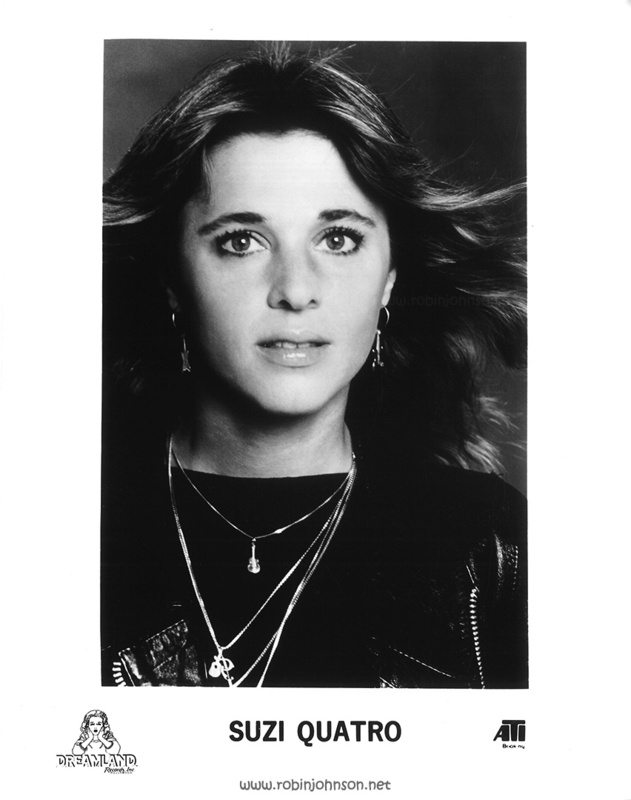 It’s a collage of the two photos used on the inner sleeves of the soundtrack album. 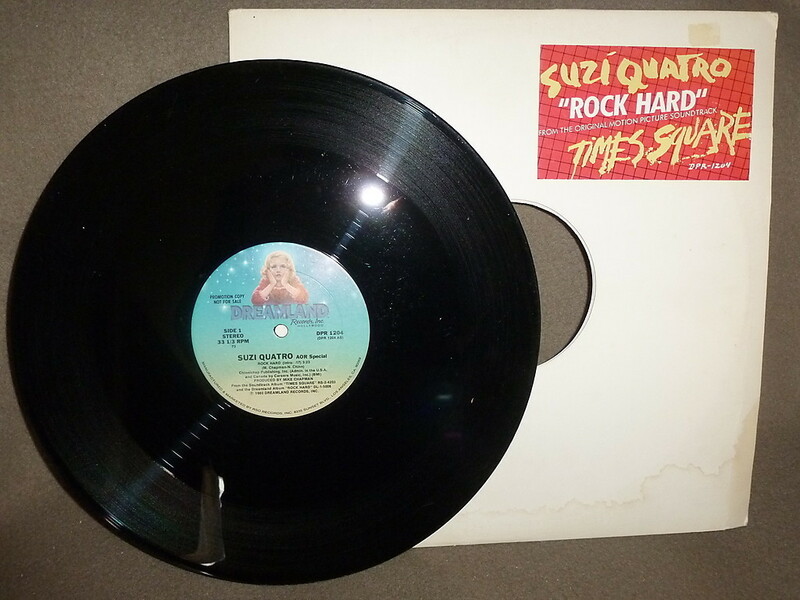 This is an Italian pressing. The sleeve’s front and back are nearly identical, and the b-side features an instrumental version of the song, which is just as exciting as you think. 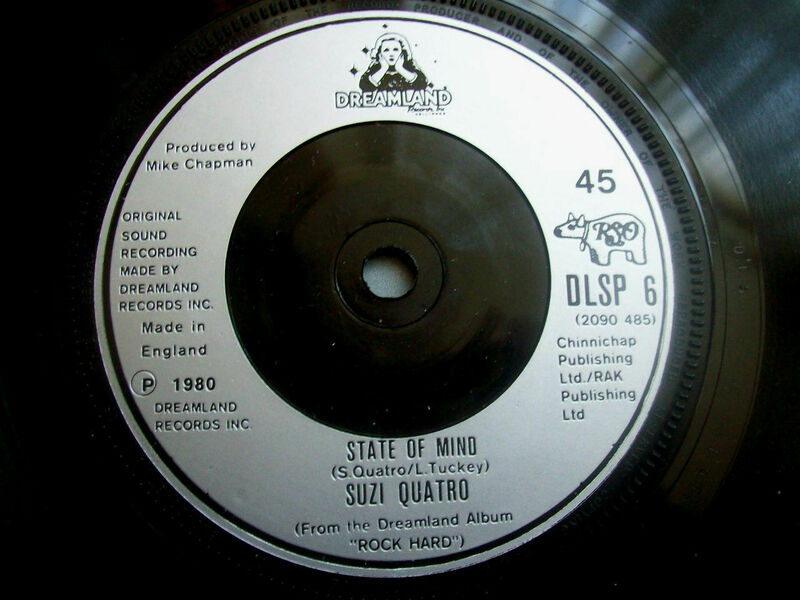 That does, however, make it the only single to feature a relevant non-album track. 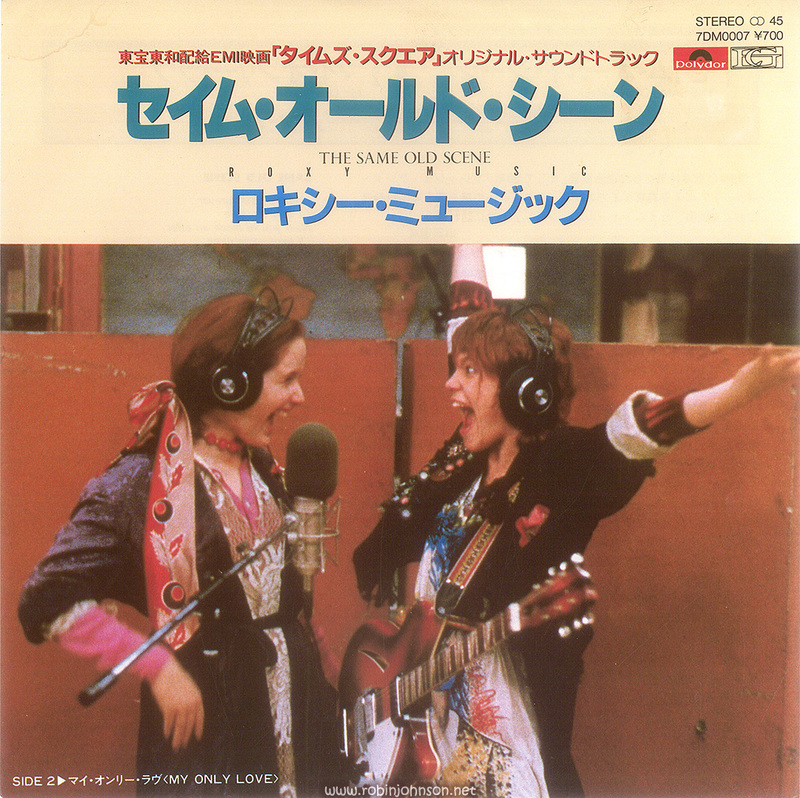 The first Japanese pressing of Roxy Music’s “Same Old Scene” is the other single to feature an image of the girls. 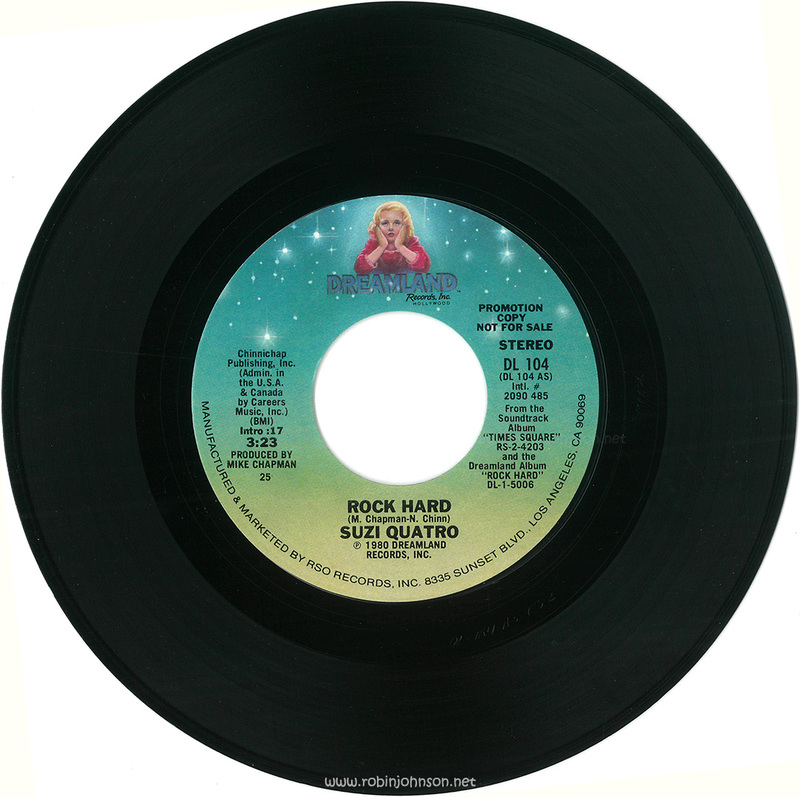 This photo appears on the inside of the soundtrack gatefold; if this single came out before the album, it may be its first appearance. 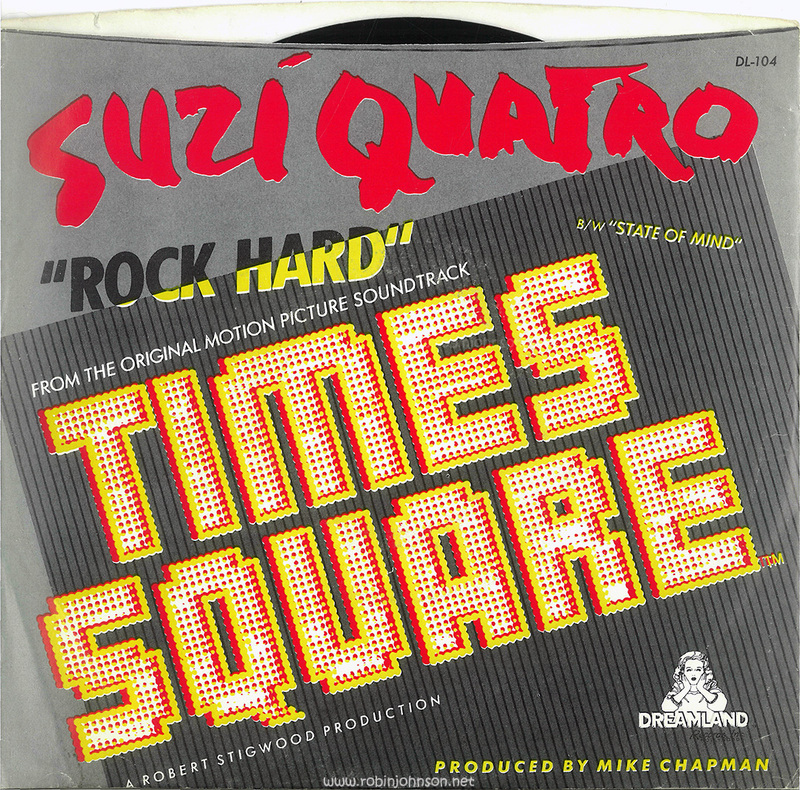 Times Square is only mentioned at the top of both sides of the insert (the actual sleeve features a world map of the vast Polydor Empire): 東宝東和配給EMI映画「タイムズ•スクェア」オリジナル•サウンドトラック / Tōhōtōwa haikyū EMI eiga `Taimuzu• suku~ea’ orijinaru• saundotorakku / Toho Towa distribution EMI movie “Times • Square” Original • Sound Track — thank you Google Translate. 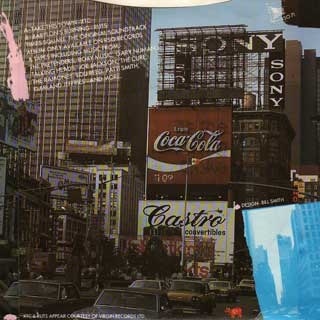 Google Translate doesn’t do nearly as good a job when it comes to full sentences in Japanese, but the essay on the back doesn’t appear to mention Times Square at all. 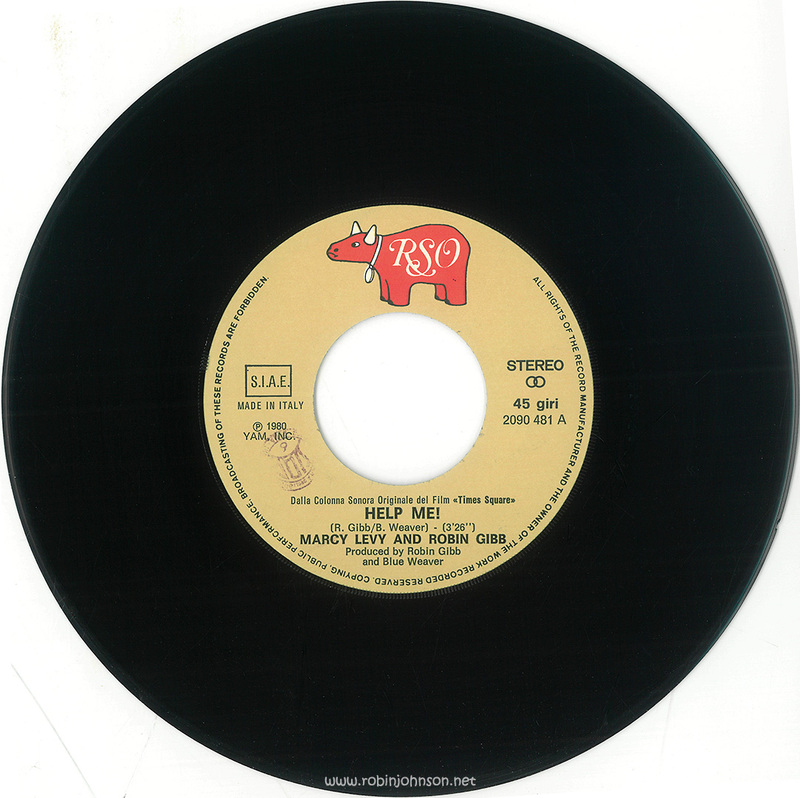 It seems to be a biography of Roxy Music, extolling the band’s influence on the New Wave scene, and heralding this single and the Flesh and Blood album as a triumphant comeback which will ensure that Roxy Music will live forever. 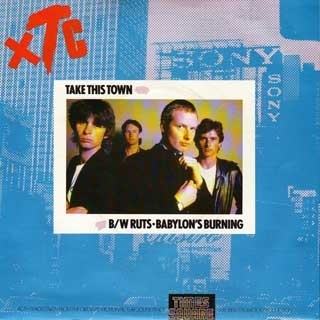 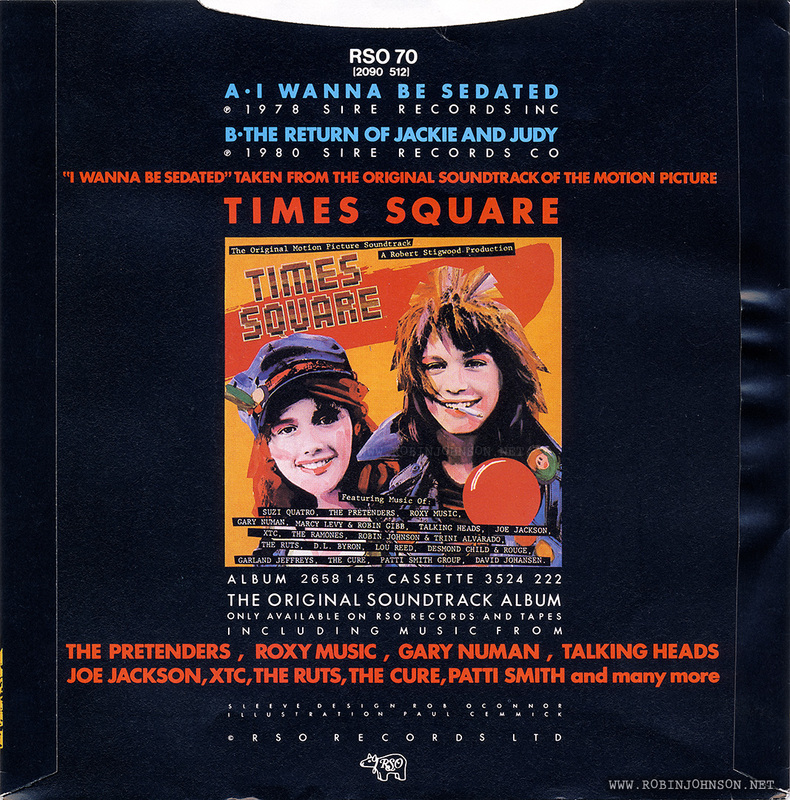 “Take This Town” by XTC, split with “Babylon’s Burning” by The Ruts, features a shot of 2 Times Square, similar but not identical to the one on the outside of the Press Folder. 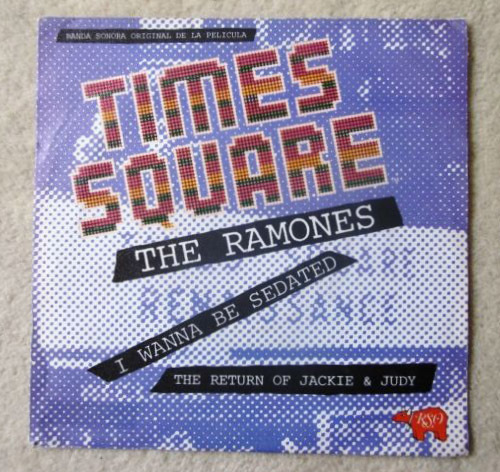 On the front it’s been colored to match the inner sleeves of the album, and there’s a tiny Times Square logo at the bottom. 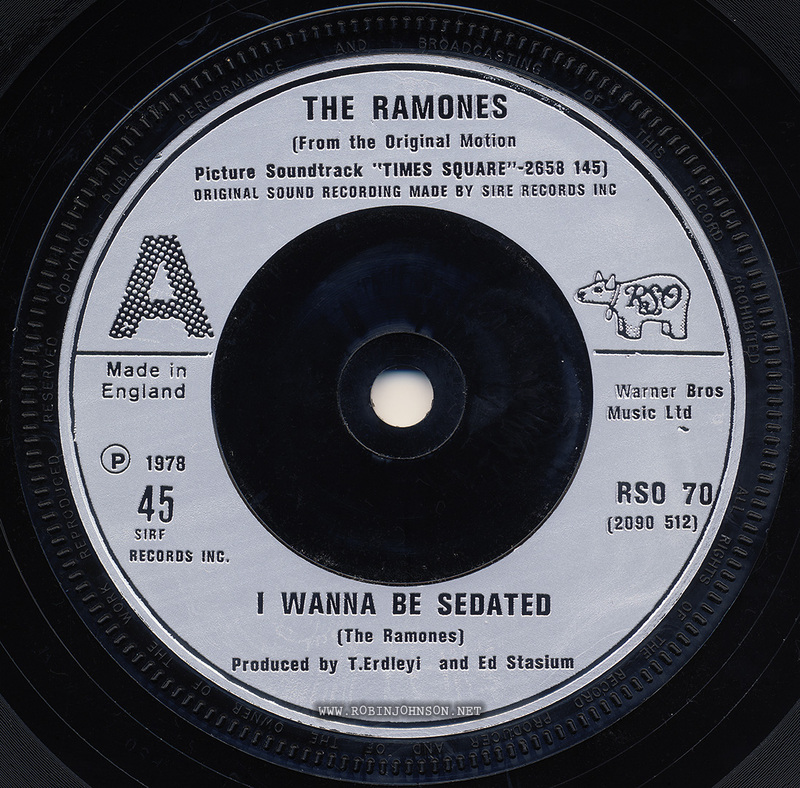 And, finally, The Ramones’ “I Wanna Be Sedated” was re-released in a combined Sire-RSO edition, and the Spanish pressing at least had a design matching the soundtrack album, using part of the pixellated image from the inside of the album gatefold and the bottoms of the promotional posters. 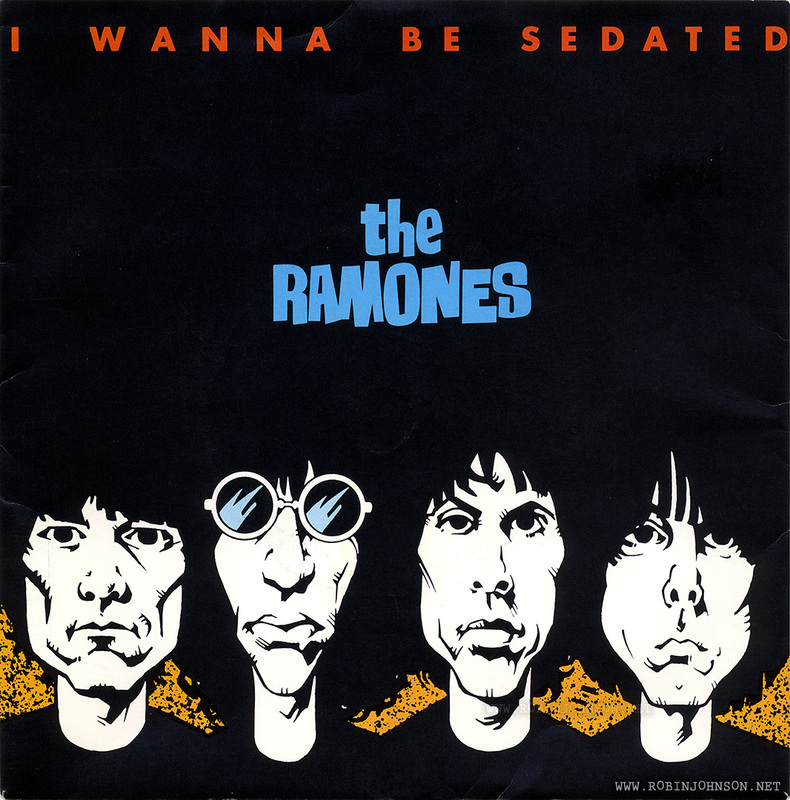 “I Wanna Be Sedated” was two years old. 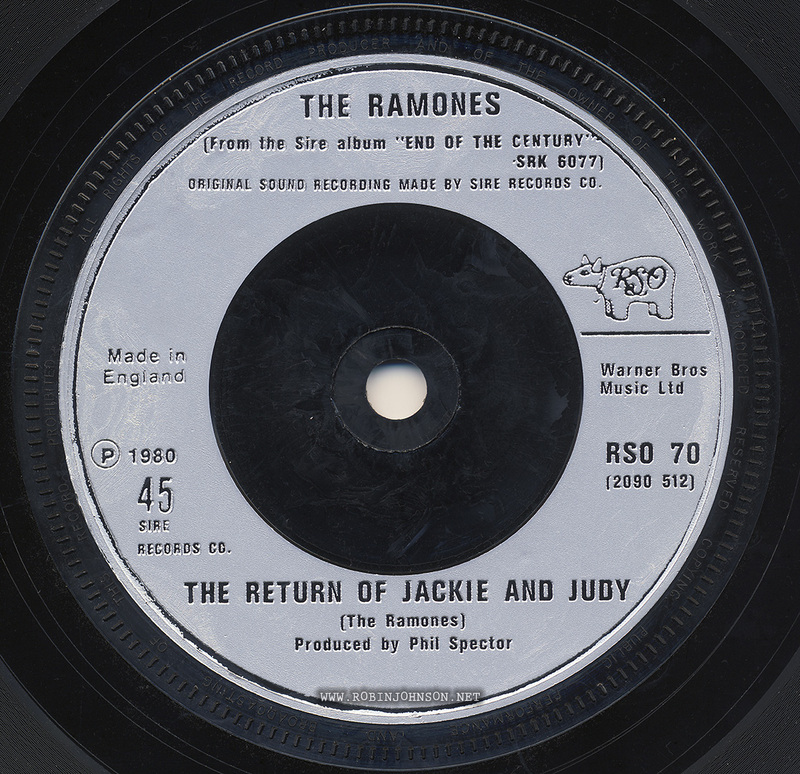 The b-side of this single, “The Return of Jackie and Judy,” was taken from the Ramones’ then-current album, the Phil Spector-produced End of the Century, and now that I think of it, would have made a good thematic fit with Times Square. 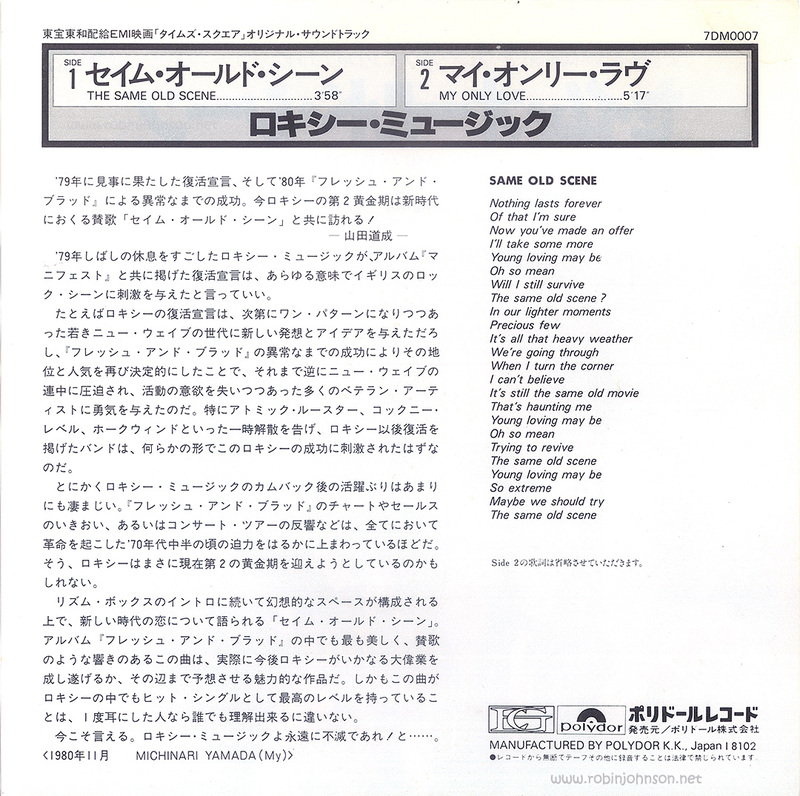 And, I think those all the singles released from the soundtrack, if not nearly all the variant versions, especially of “Rock Hard.” Let me know if I’m wrong, and if you want to translate the back of the “Same Old Scene” insert into English.